Bats Hotel in Petrich, Bulgaria. Book now. 45, Tzar Boris III Str. Location: Bats Hotel is located in the town of Petrich. Petrich is 15 km. away from the frontier with Republic of Greece and 22 km. away from the frontier with Republic of Macedonia. Accommodation: The luxurious BATS complex offers to its guests 4 luxurious apartments and 29 double rooms, all equipped with central air conditioning, luxurious bathroom, cable TV, telephone line, access to Internet and mini-bar. The specious apartments and rooms have balconies with amazing views. Business and Sports: For the organization of seminars, conferences, presentations or congress events the complex has available conference hall with 77 seats capacity. The sport center provides opportunity for relax after the busy day. It is equipped with air-conditioned modern fitness hall, Jacuzzi, sauna, massage, solarium and SPA-centre. 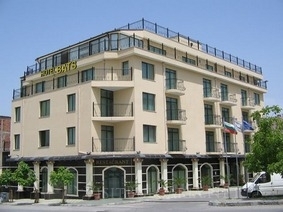 Hotel Facilities: Bats Hotel also offer cosy lobby bar, pool bar, outdoor swimming pool, a conference hall and a casino.